It is very difficult to encapsulate the incredible achievements of our beloved King in this short article. The writer, rather, has highlighted just some of the events, honours and accolades which have been dedicated to His Majesty, particularly in this auspicious year of his 82nd birthday. Born on Monday, the fifth of December, 1927 at Mount Auburn Hospital, Cambridge, Massachusetts, HM King Bhumibol Adulyadej the Great reaches his eighty-first birthday just two years after celebrating sixty years on the Thai Throne. As the Thai people - and, in fact, people all around the world - honour this year’s anniversary of the birth of the world’s longest-reigning Monarch, the Chiang Mai Mail presents this supplement, prepared by special correspondent Peter Cummins, as a “Happy Birthday” tribute to our beloved King. In his Coronation Oath, promulgated on the fifth of May 1950, the newly-crowned King Rama the Ninth vowed that, “We will reign with righteousness for the benefit and happiness of the Siamese people” and in all the years which have passed since that auspicious day, the concept of “righteousness” has dominated his reign. In fact, HM the King has, throughout his more than six decades of rule, constantly revered the age-old Buddhist concept of ‘Kingship’ as defined in the “Sutta Pitaka” of the “Tripitaka” in which a King is defined as “Mahasammata” - a King of Righteousness. The Buddhist scriptures also define the genesis of the universe and the progression of evils which befall mankind: greed, stealing and lying and the inevitable repercussions of censure and punishment. Our King has steadfastly reigned by these principles, embodying good kingship in his own life and example and often speaking out against the affliction of the evils so clearly spelled out in the Buddhist philosophy - evils and afflictions which seem to have become progressively worse in the past tumultuous years. On July 23, 2007 His Majesty the King granted an audience to Robert D. Ray, the former governor of Iowa, USA, and accompanying members of his group, to receive the first ever Dr. Norman E. Borlaug Medallion, awarded by the World Food Prize Foundation. His Majesty the King was pronounced successor to the throne in June 1946. After four years of studying in Europe, he returned to Thailand and was crowned during an elaborate and highly intricate ceremony. On April 28, 1950, a week before his coronation, H.M. King Bhumibol and Mom Rajawongse Sirikit Kitaya­kara were married. Following the coronation HM the King returned to Switzerland to continue studying. In the beginning of the Ratanakosin era, the first King in the Chakri Dynasty (King Buddha Yot Fa Chula­lokmaharach) took the title of Rama I and moved the capital of Siam from Thonburi to the opposite bank of the Chao Phraya River, and constructed Krung Ratanakosin (Bangkok). In the process of building the Royal Palace and Wat Prakaew (Temple of the Emerald Buddha), the first King in the House of Chakri refined the coronation ceremony, establishing important protocol that has lasted to this day. The annual commemoration of the coronation ceremony is a three-day affair, starting with a ritual “tham bun” ceremony on May 3 to honour the King’s ancestors. Later on the first day, another ceremony is performed, whereby flags of honour are issued to distinguish various military units. 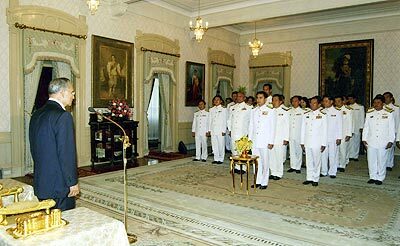 HM King Bhumibol Adulyadej calls for the new government to make peace its priority during a swearing-in ceremony at Chitralada Palace in Bangkok Monday, Dec. 22, 2008. Prime Minister Abhisit Vejjajiva, standing front row, and his cabinet members listen intently. The following day, Buddhist ceremonies continue with chanting rituals, prayers and Brahman priests announce the auspicious occasion of the next day (May 5). On May 5, His Majesty King Bhumibol Adulyadej the Great (Rama IX) conducts a merit-making ceremony, presenting offerings to Buddhist monks, and leads a “Wien Thien” ceremony, walking three times around the sacred grounds at the Temple of the Emerald Buddha. In the evening HM the King conducts another sacred ceremony: changing the yellow cloth on the Emerald Buddha, the guardian symbol protecting the Thai people, which was transferred from Thonburi to Wat Phra Kaew by King Rama I. 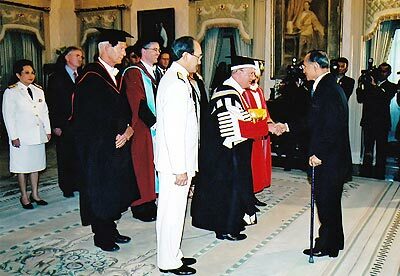 On February 21, 2007, His Majesty the King was presented an honorary doctorate degree in civil law by the former Vice-Chancellor of the University of Durham, U.K., Sir Kenneth Calman, at the Chitrlada Throne, Dusit Royal Palace. His Majesty the King continued to have many official duties over the past years, culminating in an abundance of official functions two years ago to commemorate his Diamond Jubilee on the Thai Throne, continuing right through to this year, up to his 82nd birthday. One of his many functions during this period was to open the new Rama VIII Bridge - the 475-metre long cable-stay bridge which the King had planned since July 1996, having it constructed to commemorate King Ananda Mahidol, Rama the Eighth. HM King Bhumibol introduced a number of aesthetic designs based upon the former King’s royal seal. As in all of His ideas, the new bridge was designed and built to have the least possible effect on the fragile environment of the Chao Phraya River, the riverbanks and the surrounding river approaches. After the official opening, the City of Bangkok presented His Majesty with a 24K gold model of the bridge, and a gold plate with the bridge engraved upon it to HRH Princess Maha Chakri Sirindhorn who accompanied HM the King at the opening. 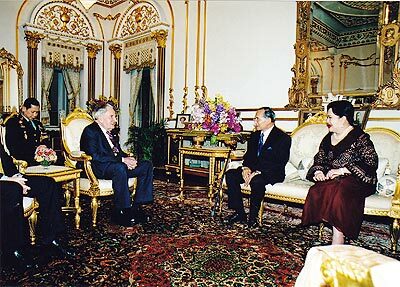 On February 8, 2007, His Majesty the King granted an audience to David Rockefeller, the honorary chairman of Rockefeller University and his guests at Chitrlada Throne, Dusit Royal Place during their visit to Thailand. Over the years, the King has established five Royal Development Study Centres - or, as they are better known - “Living Museums” - situated in the roughest terrain in their respective regions. These centres are the locale for experiments in re-forestation, irrigation, land development and farm technology which are conducted to find practical applications within the constraints of local conditions, geography and topography. His Majesty’s aim is to restore the natural balance, to enable people to become self-supporting. The first centre organized was that of Khao Hin Son, in the rocky area of Chachoeng­sao’s Phanom Sarakam District. Here, the centre studies how to turn the barren soil, caused by de-forestation, back into fertile land again. When he is in doubt, HM the King will fly over a particular area, armed with aerial photographs and maps of the terrain, noting features as they pass underneath. But, being a good photographer himself, he also takes his own pictures and later juxtaposes them over the charts to obtain a detailed image of the area of his concern which helps in his planning of specific development projects. Throughout the more than six decades that HM the King has ruled Thailand, not only Thais, but people around the world have become accustomed to seeing His Majesty travelling to remote areas of the country. He works with - and brings rational development to - even the poorest and most disadvantage groups. He is often filmed leading officials, farmers and many diverse groups up rough mountain trails, over bridges, punting along in small sampans, to initiate sustainable projects and ideas, aimed at helping the many who have been forgotten or left behind in the development process. In all these works, His Majesty has promoted a simple approach using environmentally-friendly techniques and utilizing moderate amounts of locally available resources. For example, before environmentalism became a major force in the development equation, His Majesty was using vetiver grass to prevent erosion, controlling ground water level to reduce soil acidity, and seeding clouds with simple materials such as dry ice to produce rain. His Majesty the King has stated his opinion on countless matters over the years. These royal words of wisdom reflect his great sensitivity to the needs of his people and their problems and his down-to-earth approach to problem-solving. I shall reign with righteousness for the happiness and benefit of the Siamese people, was his promise 60 years ago. To achieve desired results that are also beneficial and morally just, you need more than just knowledge: You need honesty, sincerity, and justice. Knowledge is like an engine that propels a vehicle. Moral principles are the steering wheel or rudder that leads the vehicle safely in the right direction. Knowledge helps you to understand religion on a broad basis; religion helps you understand knowledge in depth. Therefore knowledge and religion have to go hand-in-hand; they are both essential to life. Whoever possesses both knowledge and religion shall achieve success in life without fail, because they can analyse everything in detail and a rational way. Academic subjects that you are constantly being tested for, do not alone account for your survival and will not create benefit for yourself, for others, or for the country. Those with knowledge also need other additional qualifications to bring themselves and the nation to survival and prosperity. The necessary qualifications are a tender conscience, honesty in thought and deed, loyalty to the nation and your patrons, selflessness and not taking advantage of others, sincerity and meaning well to others, generosity as benefiting your status and position, and most importantly, perseverance. Practice doing projects on your own both big and small, simple and complicated, with determination, without sloth, carelessness, or vulgarity. When you want to study anything in depth, you have to study it from every conceivable angle, not only in part, or become fixated on a particular aspect. Secondly, what you must also do is consider the subject with an unbiased and unwavering heart. Do not let the dark influence of prejudice misguide you, whether it is prejudice in favour of, or against, the matter. Otherwise, the knowledge which is gained will not be true knowledge, but knowledge that is a mere illusion, or misleading. It cannot be applied to create benefit without incurring negative results. When you have clearly analysed the issue with a heart that is unbiased, then only will true understanding arise, leading to a just decision and action. You must set your mind to be objective, not allowing any prejudice to prevail. Let your heart be led by truth and justice, based on reason and morality. Knowledge, intelligence, and efficient equipment, alone cannot help us create total prosperity and stability for the country. To do so we need one other element, that is unity, or cooperation, so that we can use that knowledge, intellect and equipment to create true prosperity as desired. The King has been named an ‘Asian Hero’ among 65 prominent figures designated by Time Magazine as “Asian Heroes”. “The King’s stewardship has been so masterful that in times of crisis, Thais invariably turn to one man: (HM) King Bhumibol,” writes the article published in the magazine’s Nov 13, 2006 issue. “On two occasions - October 1973 and May 1992 - with Thailand descending into chaos, (HM) the King, armed only with his moral authority, intervened to end blood-shed,” it said. Elsewhere, His Majesty has been named the first recipient of the Norman E Borlaug World Food Prize Medallion in recognition of His Majesty’s outstanding humanitarian service in alleviating starvation and poverty, presented by the World Food Prize Foundation on July 23, 2007. The award, introduced for the first time in 2007 as a special commemoration of the World Food Prize’s 21st anniversary, is a special honour for individuals who have provided exceptional humanitarian service in reducing hunger and poverty. 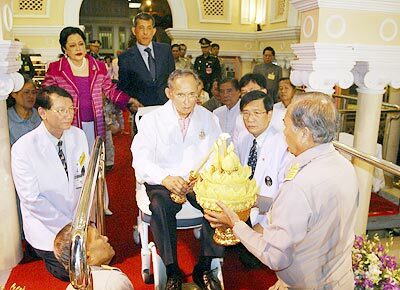 HM King Bhumibol Adulyadej lights candles on His lotus shaped krathong watched by Her Majesty the Queen and HRH Prince Vajiralongkorn during the Loy Krathong festival at Siriraj Hospital in Bangkok on November 2, 2009. “Since his accession to the throne in 1946, (HM) King Bhumibol Adulyadej has displayed a deep concern that the Thai people have sufficient food and proper nutrition,” said Ambassador Kenneth M Quinn, president of the World Food Prize Foundation. “His Majesty’s commitment to his subjects has been reflected in the more than 2,000 royal projects he has established throughout the country, the first of which was initiated in 1952,” he said. The projects include efforts to promote small-scale agriculture, the introduction of new agriculture technologies and the sustainable use of water. HM the King was also lauded by Kofi Anan, then Secretary-General of the United Nations, as the “Development King”, acknowledging his dedication to promote child health, combat iodine deficiency and increase access to education. And three years ago, His Majesty the King received the UNDP Human Development Lifetime Achievement Award in recognition of the global relevance of his call for a sufficiency approach to development, presented by United Nations Development Programme on 26 May 2006. Royal projects have benefited million of people across Thailand, with a particular focus on aiding ethnic groups and hill tribes in mountainous regions. A different type of honour was forthcoming when several hundred thousand people took part in a walkathon on the new cable-stayed bridge, an event organized by the Transport Ministry to mark His Majesty the King’s 60 years on the throne. The Republic of Korea’s Korea Invention Promotion Association, or KIPA, presented a Special Prize in honour of His Majesty, who is recognized as the “Father of Thai Invention.” This organization promotes intellectual property and expands patent management support. The Budapest-based International Federation of Inventors’ Association (IFIA) presented the IFIA Cup 2007 for His Majesty’s Chai Pattana wheel used to treat water. The IFIA also presented its Genius Medal prize to honour His Majesty’s Self-Sufficiency Philosophy, and his New Theory, which revives farming techniques based on Thai wisdom focusing on minimal use of resources but aiming for higher agricultural productivity. 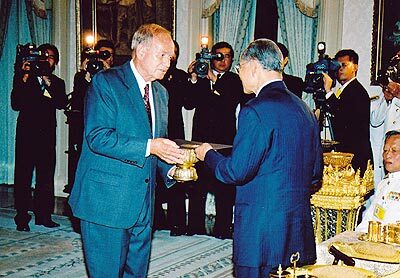 IFIA has decided to designate February 2 International Inventor’s Day in honour of His Majesty the King, whose patent for the Chai Pattana Aerator was granted on 2 February 1993 by the Department of Intellectual Property, Ministry of Commerce of Thailand. Two years later, the Cabinet approved the proclamation of February 2 each year as National Inventor’s Day, when activities are organized to celebrate this event. 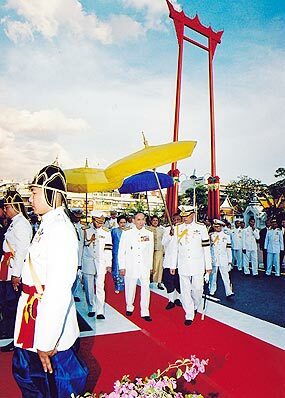 Thailand hosted the first International Inventor’s Day Convention from February 2 to 5 2008, in commemoration of His Majesty the King’s 80th Birthday Anniversary, 5 December 2007. His Majesty is the first member of the Thai Royal Family to be granted a patent for an invention. As one would expect from a Monarch defined as “Mahasammata”, or a “King of Righteousness”, by all the people and who, upon his accession to the Throne in 1950, embraced the “Tenfold Moral principles of the Sovereign”, His Majesty has ruled quietly and without ostentation. Starting very early in his reign and continuing to this day, HM the King, usually accompanied by HM the Queen and second daughter HRH Princess Maha Chakri Sirindhorn, travelled to the far corners of the Kingdom to learn first-hand from the farmers and peoples of the rural areas about their problems. Again, as with all his other interests, the Monarch studies, observes, photographs and imbues himself with all the relevant knowledge and facts that he needs to move forward with recommendations, implementation of beneficial projects and follow-up. The Thai Monarch is probably best known, universally, for his unbending resolve to improve the lives of each and every one of his people - a singular dedication to their welfare which has been acclaimed from all corners of the world. A lasting image of HM the King is that of a man, often kneeling or sitting on the ground, poring over charts and topographical maps of the area, while surrounded by local farmers and villagers discussing their problems. It has been recorded that HM the King has spent more than 200 days per year, for more than three decades, in rural areas where he has initiated some 2,000 projects aimed solely at improving the well-being of his people. All of us at the Chiang Mai Mail join people throughout the Kingdom of Thailand in extending our humblest best wishes to His Majesty King Bhumibol Adulyadej the Great for a most happy 82nd birthday.